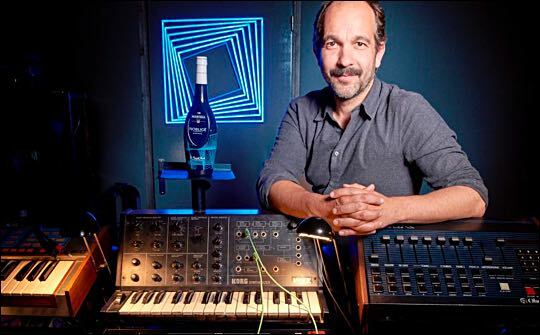 The Martell House has unveiled an electrifying limited edition cognac bottle: La French Touch by Martell, created by Etienne de Crécy, pioneer and emblematic figure of the French Touch music cult movement. In the space of 20 years, the French Touch has become one of the biggest musical revolutions of the 20th century through its unique contemporary and planetary sound, while widening its spheres of expression into arts, graphics, video and fashion. “A bold move! Creating a limited edition which goes beyond the mere universe of one designer and which conveys an extra dimension, something bigger, with more energy... La French Touch! I'm very proud to have been chosen to orchestrate this limited edition,” comments Etienne de Crécy. Along with Martell blue, the neon lights, iconic modules of the French Touch, are the signature of this limited edition. Used in interplay of vibrating lines, with UV ink, they create an electrifying dimension evoking the unique magnetism of the ‘City of Lights’ at night. “The graphic design of the electric lines evokes the Cube, equally emblematic for the French Touch and Etienne de Crécy, reminding us just as much of a music studio or of the centre stage of a night-club or an art gallery, where one is throbbing to the beat of a musical performance. “It came naturally. The neon was getting further away, fading out, and suddenly a rhythm appeared. It was both really abstract and really powerful. An almost musical form, strong and sensitive, which everyone can interpret in their own way,” he adds. Available in Martell VS, Martell VSOP and Martell Noblige, the limited edition glows in the dark in night venues.